For the Sole: Big Announcement! If you follow me on Twitter or Instagram you'll have probably seen that my family has had a pretty major transition in the past few weeks. 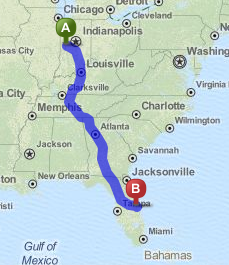 My wife was offered a fantastic career opportunity and we've transitioned to The Sunshine State! We're finishing up getting unpacked and are about 90% of the way finished - who would have thought that moving with two kids under two was a tad bit difficult? I'm excited about the opportunities that await us and most of all the fact that I've been able to pack my "winter running gear" in a box and tuck it back in the back of our closet. I'm hoping to not need that stuff for a VERY VERY long time! Coming out of the snowiest winter in the history of Indiana made this transition a no-brainer.